As the preliminary reports of Cencus is not yet out, I suggest to use the following data which is the recent most data available in Govt records so far…. Though the data is published in Oct 2009 report. DAMS: Congratulations on securing rank -22 in PGI-2010 What is the secret of your success in this exam? Dr Nikhil Nair : Consistent hard work, preservation, and an unwavering, focused mind. Dr Nikhil Nair: Family &friends provided me with a comfort zone & shielded me from many extrinsic distractions. Dr Nikhil Nair: Everyday !!! I have had nightmares about not being selected in any exam. DR Nikhil Nair: I read AA for Medicine& Surgery, Rachna Chaurasia for Micro, Gobind Garg for Pharma, Sakshi Arora for OBG& ENT ACROSS for short subjects. DAMS : What do you think is the better way of preparation between selective, intensive study and wide, extensive study? What did you choose as your style of studding? Dr Nikhil Nair: Multiple PG exams give one a Multiple of options to fall back upon& choose from in case one of your exam goes badly. I am all for it! Dr Nikhil Nair: I gave special emphasis to Pharma, Micro , Surgery & most of the short subjects. DR Nikhil Nair: My strategy in PGI exam was to analyze each option carefully before marking but once I had decided on one, I didn’t hesitate before marking it. I attempted 248/250 as I had decided to give it my best shot. DAMS: Which teacher in DAMS influenced you most and what do you like about DAMS and would recommend to your juniors ? 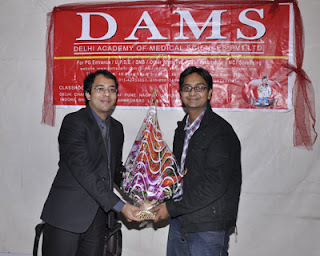 DR Nikhil Nair: I was highly influenced by Dr Sumer Sethi and I would strongly recommended My juniors to join DAMS. She secured Rank 1 in AIIMS NOVEMBER 2010. 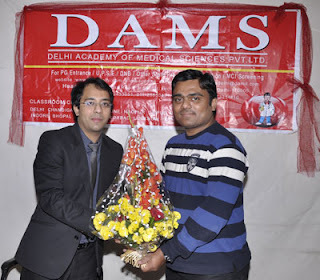 DAMS: Congratulations on securing a Rank 1 in AIIMS Nov 2010. What is the secret of your success in this exam? DAMS: Which books did you read for the MCQ Revision & theory part ? Dr Zohra Ahmed: Couldn’t have done without the classes in 3rd yr in DAMS. They were I think a keystone in my preparation . I covered a good chunk of my course in 3rd yr itself. DAMS foundation course is well planned and covers a whole syllabus well on time. DAMS has a pretty intensive programme of study in 3rd year covering a good part of the course of final yr & 3rd year subjects , Their notes are good to revise before PG- entrance exams-concise and high yielding. Learn about PG medical entrance with DAMS. Leading Institute for PG medical entrance in India. Ans 41: (b) It is independent of height and weight..
(Dr. Ruchi Rai, is an apt clinician and a teacher. She has her clinic in Delhi and is associated with various ophthalmology centers in Delhi and Noida. Her passion for academics and teaching made her associate to leading PG entrance centers. 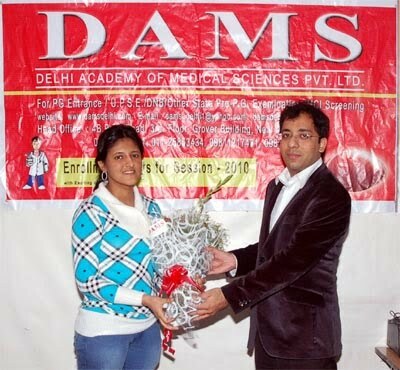 She is a faculty in Delhi Academy of Medical Sciences [DAMS] since six years. She travels extensively to take classes for PG entrance exams all over India. This wide and personal interaction with students and her vast experience in teaching were the guiding force to write this book. The author is an active member of All India Ophthalmological Society [AIOS], Delhi Ophthalmological Society [DOS] and Noida Ophthalmological Society [NOS] with published papers in international journals.